My Christmas card this year is a ghost story. I tried writing it according to the principles set out by master ghost story author MR James in the prefatory essay to his first anthology, Ghost Stories of an Antiquary. If you haven’t read James, do; his story Martin’s Close is one of the best ghost stories ever written. My story is set in the Dales, somewhere, I imagined between Arncliffe and Malham. There is a Dales Hamlet called Black Leach, but it’s below Settle. I do not know whether there is a Black Leach Farm and if there is, whether it has any ghosts. Probably. I hope you enjoy Cold Night at Black Leach Farm. It is a measure of my Aunt Cissy’s devotion to duty that she drove out onto Malham Moor on that afternoon in December 1963 that the Daily Mirror subsequently dubbed `The White Death’. Fleet Street was less prone to hyperbole in those days and to the sixty poor souls who died in that terrible blizzard, that headline was no more than the tragic truth. When Cissy arrived for work that morning a message was waiting for her at reception. Tom Sutton of Black Leach Farm had telephoned from a neighbour’s house to say that he had run out of his heart pills and needed more right away. Cissy shook her head. The area she served as District Nurse included dozens of small-holdings, all owned by folk like Sutton – hard Dales men who would not think twice about delivering a breach lamb on the side of a hill in a thunder storm, but who were entirely incapable of looking after their own health. A childless widower, Sutton had lived, worked and grown old alone on the farm which had belonged to his family for generations. Cissy did not like him. He was dour and mean-spirited, with a bullying manner. His clothes were always filthy and his personal hygiene was no better. The farm consisted of fifteen acres of bleak moorland bordering Black Leach, a natural lake that had been deepened around the turn of the century to form a reservoir which provided water to the towns and villages in the valley below. It would not take Cissy more than a few miles out of her way to drop off the Angina medication on her way home that evening. By afternoon however, an icy draught from the window made her look up from her desk to see black clouds lumbering across the sky. Once snow cut off the hill farms, they could be isolated for days, even weeks. If Sutton did not get his medicine right away there would be no telling how long it might be before she would next be able to deliver it. She collected the pills from the dispensary cupboard, signed the register and dropped the bottle into her bag. In reception the doctor and the holiday relief receptionist were both preparing to leave, hoping to get home before the weather broke. Cissy put on her coat and hat, and tucked her scarf into her collar. Outside, it was already growing dark. The first flakes of snow were flurrying across the yard, driven by a biting wind. She hurried over to her car and climbed in. 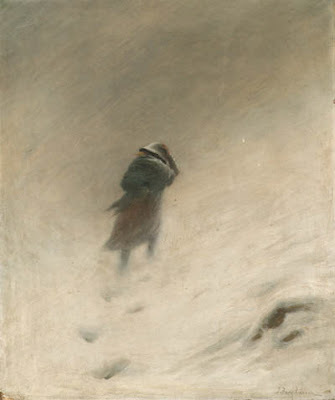 She was scarcely out of the village when the blizzard broke, and by the time she had ascended the steep hill out of the valley the snow had started to settle. At the top of the hill, the wind grew fiercer and more malign, as if it was trying to blow her little Hornet off the hillside. Cissy knew well the bleak expanse of moorland that extended ahead, but today she could scarcely see beyond the bonnet of the car. She usually reckoned on a visit to one of the farms adding twenty minutes to her journey home; three quarters of an hour, if she stopped for a cup of tea. Today, however, she had been crawling along the moor road for most of an hour when the stunted clump of hawthorn that was her landmark for Black Leach Farm appeared out of the darkness, ghostly and amorphous under its heavy covering of snow. It took her by surprise and she overshot the turning. She backed up a few yards and turned onto the track, which was no more than a rut running beside the wall of Sutton’s bottom field. At the end of the field a dilapidated gate hung from one hinge across the track, barring her way. Leaving the engine running, Cissy opened her door and plunged out into the storm. In an instant the icy wind had plucked off her scarf and hurled it away into the night. Snowflakes stung her cheeks. She staggered over to the gate, and dragged it open. As the hinge squealed in protest something leapt out of the shadow of the tumbledown wall and disappeared into the snow. Cissy let out an involuntary cry. A second sheep clambered to its feet and skittered, bleating, after the first. She felt a pang of guilt at having scared them away from their sheltered spot, and could only hope that they would return after she had passed on. Poor things! Sutton should have rounded them up and kept them in the barn overnight. If he lost any to the storm, she thought, he would only have himself to blame. She stumbled back to the car, climbed in, and inched it through the gateway. She was pulling up again to close the gate behind her when the car lurched sideways and dropped several inches, fetching up with a loud crack and a jarring jolt. Clouds of steam billowed from under the wheel arches. The engine spluttered, coughed and died. Cissy pressed her head on the steering wheel. Why did these things always happen to her? And why today, why here? She climbed wearily out of the car and inspected the damage. The drifting snow had hidden the edge of the track, and Cissy had allowed the passenger-side front wheel to slip over the edge and drop into the ditch beside. Liquid trickled out from under the crumpled sill, dark against the snow; oil perhaps, or petrol. My aunt was a bit vague about the workings of cars. Even to her, though, it was obvious that the Wolseley was not going any further tonight. She collected her bag from the car and set off along the track in the direction of Sutton’s house. Or so she hoped, for she could not make out as much as a glimmer of light through the storm. For all she could see, the wind might have picked up the farm buildings as it had her scarf, and blown them clear off the face of the earth. Snow crept over the tops of her boots and trickled down to melt between the fleecy lining and her stockings. Flakes settled on her cheeks and eyelashes. Finally the black bulk of the farm buildings loomed out of the night. Cissy let herself into the yard. The house was in darkness. Perhaps Sutton was already in bed. She trudged across to the kitchen door and hammered on the pane, then tried the latch. The door swung open. She kicked the snow off her boots and stepped inside. In the shadow of the barn, the kitchen was pitch black. Few of the hill farms had mains electricity, and old Sutton had yet to be persuaded that instant heat and light were anything more than the excesses of a decadent age. She called his name. Nothing broke the silence but the soughing of the wind. She edged forwards until she bumped into the kitchen table and explored the top with her hands. Her sleeve brushed against a cup, knocking it off the edge of the table to shatter noisily on the flags. Then her fingers closed over a matchbox. She picked it up and shook it. It rattled reassuringly. She slid open the drawer, fumbled with a match and struck it against the side of the box. She found herself looking directly into Sutton’s face. He was sitting in a chair by the hearth, arms folded, staring straight at her, his features twisted into an expression of apoplectic rage. Cissy stammered an apology. He remained silent. Understanding crept over her like a cold draught, prickling the hairs on her skin. She reached forwards and touched his cheek. He was stone cold. She moved her hand down to the side of his neck and searched for a pulse. There was nothing. He was dead. Cissy swore and dropped the spent match, plunging the kitchen back into darkness. She blew on her burnt fingers, then struck another match and held it aloft, like a tiny torch. There was a lamp on the mantelpiece. She hurried over to it, lifted off the cracked chimney and just managed to touch the match to the wick before it died. The flame budded and blossomed, and sent the night flittering into the farthest corners of the room. By the lamplight she saw that Sutton’s complexion was livid, congested with blood. It looked as if the old man’s heart had finally done for him after all. She leant back against the range and buried her face in her hands. What on earth was she to do? A gust of wind rattled the window. She looked up. Snow still raged out of the blackness of the night and battered at the pane. She acknowledged at last the grim fact she had been trying to ignore since her car had slipped into the ditch: she was going to have to stay the night at Black Leach farm. She could at least cover up Sutton’s corpse. Picking up the lamp, she walked through to the living room, or what had once been the living room: for over the years it had become an extension of the yard. The furniture was still there, good, solid Victorian furniture at that; but cracked and filthy, and buried under sacks of feed, pieces of rusted machinery and rubbish. The pattern on the carpet was lost under many years’ accretion of oil and mud. In the corner lay a discarded, stained and torn tarpaulin. Cissy dragged it through to the kitchen. A musty smell rose off the cloth as she unfolded it and draped it clumsily over the old man’s corpse. Even Sutton deserved a better shroud than that, she thought, but it would do for the time being. A rummage through the kitchen cupboards suggested that the old man had lived entirely on plain biscuits. Cissy selected an unopened packet of digestives and walked back through the living room into the hallway. She stood for a while at the bottom of the stairs, looking up. The landing was shrouded in gloom. A shiver ran fingernails down her spine, but she started up. The lamplight wove itself through the banisters, throwing slanted patterns of light and shadow onto the walls and ceiling. The landing was strewn with dirty washing. As she picked her way through it a floorboard creaked beneath her feet. She crossed to the nearest of the two doors, opened it and looked inside. The room was crammed with dusty tea-chests and broken and discarded furniture. Ruptured cardboard boxes spilled their contents over the floorboards. In one corner enough space had been cleared for an old tin hip bath, placed there to catch a drip. A dead mouse floated in a couple of inches of scummy water in the bottom. Cissy shuddered and closed the door. The other room was, thankfully, better appointed than the rest. It had a double bed with pot cupboards on either side, a wardrobe, a washstand and a chest of drawers. The floor was carpeted. There were no curtains, but the night outside was black except for the flurries of white flakes that pattered on the glass. Here and there were dotted about the pathetic evidences of an old man’s life; grimy pyjamas on the pillow, an open packet of biscuits on one of the pot cupboards and beside the bed, a jerry half-full of pungent urine. Cissy set her lamp down on the cupboard beside the bed and slid the chamber pot under the bed with the toe of her boot. The prospect that this would be her bedroom for the night was grim; but it was more attractive – or in any case, less unattractive – than the alternatives. The bed was unmade and the linen, filthy and stinking. She stripped it off, bundled it into a ball and threw it into a corner. The mattress was stained, but she could have saved herself the effort of turning it over, for the underside revealed itself to be no better. On a shelf in the wardrobe she found a sheet and two table cloths, old and worn to holes, but clean and serviceable. She was about to close the door when her eyes lit upon a small stack of books on the wardrobe floor. The undisturbed layer of dust on the top book suggested that they had not been touched in many years. Cissy was fairly sure that Sutton was illiterate, so perhaps they had belonged to his wife. She remembered hearing once that Mary Sutton had been an educated woman. Anyway, there might be something amongst them which would serve to while away an hour or two, for despite the darkness of the night sky it was still not yet eight-o-clock. With a little ingenuity she managed to cover the mattress and the blankets so as to avoid any direct contact with either, then took off her coat and draped it over a chair, heaved off her boots and climbed into bed fully dressed. She made herself as comfortable as she could, then picked up the top book and wiped the cover clean on the blanket. It was entitled ‘Solly Simmonite: Or, Temperance Rewarded’. She flicked through it briefly, then discarded it on the pot cupboard beside the lamp (those of you who knew my aunt Cissy will confirm that she was no advocate or exemplar of temperance). The next was a dog-eared copy of Ivanhoe, which joined Solly Simmonite without so much as a second glance. When she picked up the third book, however, her interest picked up. It had the appearance of a notebook or ledger, on the cover of which was written `My Diary’ in a tiny, crabbed hand. Cissy opened it. 11th May, 1922. ‘Reader, I married him’, as dear Jane Eyre so famously said. Yes, diary, it is true: today, Tom and I pledged ourselves to each other for eternity! I can still hardly believe it! I felt so proud to see him standing beside me, stern and handsome in his suit. How I do love him! Papa was very brave, for I know he worries how he will get by now I have left to keep another house. He shook hands with Tom, too, and conversed with him as if they had been lifelong friends, despite his concerns. After the feast Joe Garthwaite brought us home in his trap. Tom changed back into his work clothes and took feed to the sheep. As he said, “tis no special day for them”. My first taste of the life of a farmer’s wife! I am distraught! Tom and I quarrelled today. In his anger he used rough language towards me, and said that I was no help about the farm. After all I have done! How could he be so cruel? I have locked myself in the bedroom and will not let him in, no matter how he entreats me. A few pages on, Mary described a second argument during which Tom shook his fist in her face and stormed out of the house, to return hours later, drunk. 3 November 1922. My time has come again. I have managed to hide it from Tom for two days, but how long can I go on? I do not want to deceive him, but how can I tell him the truth when I know that it will make him angry? A few days later, Tom hit her for the first time. From then on, the diary became a daily record of her husband’s abuse. Cissy began to discern a pattern to the violence. For several weeks the couple would live, by and large, in a state of sullen truce, and Mary would take up the greater part of each entry lamenting her boredom and frustration with a life that came nowhere near to meeting her romantic ideals. But with the passing of each month her failure to conceive a child threw Tom into a violent rage from which he would not emerge for several days. By the summer of the following year she had taken to keeping her journal in secret. Tom seemed to regard her literacy as symptomatic of the gulf between them, and would fly into a rage if he caught her so much as looking at a book. Writing whenever her husband was out of the house, Mary faithfully recorded her attempts to conceive. Cissy winced at the jumble of ignorance and half-truths the poor woman accepted as medical fact. In her desperation to conceive a child she had tried every folk remedy she came across, and followed every superstition, no matter how absurd. Cissy looked at her watch. Half-past ten! She had been lost in Mary Sutton’s loveless marriage for the better part of three hours. No wonder her eyelids were drooping. She thumbed through the rest of the book, only stopping to read when a particular word or phrase caught her eye. 11 May 1924. He said today that if I were a sheep he would slaughter me. He calls me ‘shrivel-womb’ all the time now, even in front of others. 5 November 1924. Told him what Dr. McLaren had said, that the problem could be with him. Black eye. 3 March 1925. Woke up last night to find him lying awake, staring at me. In his expression I saw only despisal and loathing. I wish I had the courage to suggest that I sleep in the spare room, he frightens me so. What am I to do? After five more inconsequential entries the diary ended abruptly. Cissy flicked through the pages, but the rest of the book was blank. When she awoke, she could not recall when she had nodded off, nor how long she had been asleep. All thought was crowded out by a terror which flooded over her as she came to her senses. The lamp had burnt out. The snow had stopped falling, too, and the clouds had rolled on south, lightening the night sky a little. She lay perfectly still, breathing slowly, trying to control the pounding of her heart. Perspiration formed cold beads on her forehead and plastered her clothes to her skin. She heard something and knew instantly that it was a repetition of the sound that had awoken her. It came again, soft but unmistakeable: the sound of a footstep on the stair. Icy fear paralysed her. Even breath would not come. She lay immobile, her eyes fixed on the door, listening to the muffled footfalls make their slow ascent. They reached the top of the stairs. The landing floorboards creaked. The handle turned. With a quiet click and a rush of cold air, the door swung open. Cissy could just make out the pale bulk of a figure standing in the gloom of the landing. It took a shambling step into the room and she saw that it was Sutton. A wave of conflicting emotions swept over her. What won through was a sense of relief. Somehow, she thought, she must have misdiagnosed the farmer’s condition. He must have been in some profound state of unconsciousness from which he had awoken in the night and stumbled up the stairs to the comfort of his bed. He took another ponderous step towards her and she saw his eyes. She ran cold again. He was still dead. Of that, she was quite certain. Yet those dead eyes were not devoid of emotion: they looked straight at her, burning with a cold loathing. He stretched clawed fingers towards her. She took an involuntary, sobbing breath. The air spread warm through her body and thawed the frost in her limbs enough for her to start inching back across the bed. Another shuffling step and he was almost at the bedside. She continued to edge away, not taking her terrified eyes from his for a moment. Then something in the bed halted her progress. Something bulky and protuberant, like a sack of bones, but which wriggled and writhed against her side, tickled her cheek with a few straggled hairs and made faint mewling sounds of distress, close to her ear. Cissy has no memory to this day how she got from the bed to the wardrobe. She has a vague impression of tumbling over the thing in in the bed and falling onto the floor beyond. The next thing she recollects is being squeezed in amongst naphtha scented clothes and hanging on for dear life to the tie-hooks on the doors. From outside came a cacophony of high pitched screams and guttural cries, interrupted by sporadic bursts of violence. Something like a cat-fight, she subsequently said, but at the same time unlike anything she had ever heard before or since. How long the noises went on, she was not sure. She recollects that she screamed when something heavy crashed into the wardrobe door. More noises, followed by a final, terrifying shriek; then the noises tailed away to a deathly hush. Cissy sank into a squat on the floor of that wardrobe and stayed there until at last, sleep took her. When she awoke, aching and full of cramp, she listened at the doors for several minutes before daring to open one of them a crack. She peered into the room. The sky was brightening with the first glimmer of dawn. Lying spread-eagled on the bed was the corpse of Sutton, face-down. Of the unseen thing that had been lying beside her, there was no sign. Cissy was not sorry that it was so, for even the momentary sensation of it wriggling and writhing by her side had been enough to tell her it was something better not seen. She emerged cautiously from her hiding place, looking about for any sign of danger. The room was silent and still. She looked down at the body on the bed. It would be best practice to roll it over and test for signs of life, but she knew that she could not touch that body, nor see its face, not for anything. She picked up her boots and coat, but took them downstairs to the kitchen to put them on. The chair upon which Sutton had died was thrown over and the tarpaulin lay on the floor beside it. Cissy unlocked the front door, let herself out and walked two miles through the snow to the next farm. She never made any official report of her experience, not at Sutton’s inquest, nor through any other channels, which is not to say that she never spoke about it at all; in my family, her story is well known. Right up to her recent death, it remained Aunt Cissy’s conviction that some malevolent spirit residing within Tom Sutton survived his death for a short while. She believes that this residual evil inhabiting the dead man’s corpse intended to harm her – and might well have done so, but for the thing which lay in the bed beside her. Whether the purpose of its battle with the creature that had once been Sutton was to protect my aunt, or whether it was just settling old scores, she does not care to speculate. A few years ago, whilst researching an unrelated matter, I came across a small piece in a bound library volume of the Craven Herald newspaper for the year of 1925. It reported the findings of the inquest into the death of Mary Sutton. Her husband had given his account of how he had discovered her, crushed and suffocated under a collapsed stack of baled hay. The inquest had found no reason to dispute his evidence. The date of the accident was given as the ninth of March. The Coroner’s verdict was death by misadventure.